This refreshing cold peanut noodle salad is perfect for a weeknight. Enjoy alone or top with grilled chicken or shrimp! Sprinkle the prepared cucumber with ½ teaspoon of salt, then set aside for at least 10 minutes. This will help draw out any extra water. Drain well, then set aside. Prepare the noodles according to package directions. Drain, then rinse under cold water. Set aside. While you are waiting for the water to boil, prepare the dressing. Whist the peanut butter, rice vinegar, soy sauce, sesame oil, and red pepper flakes (if using) in a medium mixing bowl until smooth. If the dressing seems too thick, add water, 1 tablespoon at a time, until you have a pourable dressing. 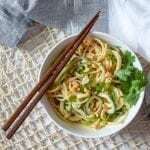 To the bowl with the dressing, add the drained noodles, salted cucumber, scallions, and cilantro. Toss to combine. Transfer the salad to a serving dish, then garnish with the roasted peanuts. Enjoy!